[142 Pages Report] The Global Microspheres Market size was valued USD 3.98 Billion in 2016 and is projected to reach USD 6.68 Billion by 2022, at a CAGR of 9.02% between 2017 and 2022. In this report, 2016 is considered as the base year and the forecast period is 2017 to 2022. Note: *Core competencies of the companies are captured in terms of their key developments, SWOT analysis, and key strategies adopted by them to sustain their position in the market. This research study involves extensive use of secondary sources, directories, and databases (such as Hoovers, Bloomberg BusinessWeek, and Factiva) to identify and collect information useful for this technical, market-oriented, and commercial study of the microspheres market. The primary sources mainly include several industry experts from core and related industries and preferred suppliers, manufacturers, distributors, service providers, and organizations related to all segments of the industry’s supply chain. After arriving at the overall market size, the total market has been split into several segments and subsegments. The figure below illustrates the breakdown of the primary interviews based on company type, designation, and region conducted during the research study. The value chain of microspheres market starts with bulk chemical and material suppliers. It includes many small and big chemical and material companies who provide raw materials such as glass, ceramic, polymer, and other chemicals involved in the manufacture of microspheres. These raw materials are made available to microspheres manufacturers either by supplying or through vertical integration. Microspheres are obtained through a series of processes. According to industry experts, raw material cost contributes significant value addition to the overall price of microspheres. Major value is added during the manufacturing process, where a great amount of effort and expertise, mainly in terms of balancing the ingredients is required to manufacture microspheres suitable for different applications. These microspheres are then either sold directly to end users or to distributors. The final products are used in applications such as construction industry, medical technology, life sciences & biotechnology, paints & coatings, cosmetics & personal care, oil & gas, automotive, aerospace, and other such industries. This report categorizes the global microspheres market based on type, application, and region. The global microspheres market size was USD 3.98 Billion in 2016 and is projected to reach USD 6.68 Billion by 2022, at a CAGR of 9.02% between 2017 and 2022. The superior structural properties of microspheres, development & modernization, and increasing demand from current and emerging applications are expected to drive the demand for microspheres globally. The construction composites application segment dominated the microspheres market in 2016. The market for medical technology application is expected to witness the highest growth rate between 2017 and 2022 due to the growing number of implant surgeries in North America, Europe, and Asia-Pacific. The medical technology segment is expected to be the largest application of microspheres by 2022. The growing healthcare industry in the U.S., the Middle East, and Asia-Pacific countries such as China, Japan, and India is also driving this segment. Based on type, the microspheres market is classified into hollow and solid. The market is dominated by the hollow microspheres segment due to their low crush strength, density, and absorption. The hollow microspheres segment is also projected to be the fastest-growing type segment of the microspheres market during the forecast period. The microspheres market is classified based on raw material into glass, ceramic, fly ash, polymer, metallic, and others. The glass microspheres segment dominated the microspheres market in 2016, while the metallic microspheres segment is projected to witness the highest CAGR during the forecast period. Currently, North America is the largest microspheres market, in terms of value, closely followed by Western Europe. Some of the factors driving the growth of the North American market are the high growth of end-use industries, amplified local manufacturing, and increased number of domestic players. Asia-Pacific is expected to be the second-fastest growing microspheres market due to the high demand from medical technology and construction composites applications. 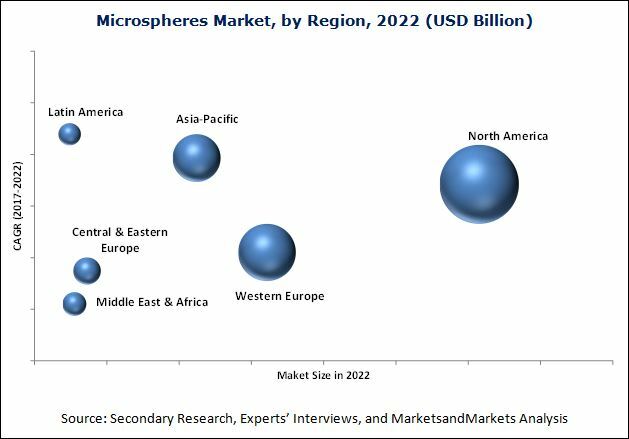 The presence of major developing nations such as China, India, and South Korea is also a major driver for the microspheres market in the region. The major restraints for the market are fluctuating raw material prices, lack of quality control across developing countries, and huge investments required in R&D. Expansion is the most preferred strategy adopted by key market players to sustain in this highly competitive market. The major opportunity for microspheres manufacturers are emerging economies such as China, India, and Brazil. Some of the important manufacturers are 3M (U.S.), Potters Industries LLC (U.S.), AkzoNobel N.V. (Netherlands), Matsumoto Yushi-Seiyaku Company (Japan), Trelleborg AB (Sweden), Luminex Corporation (U.S.), Momentive Performance Materials Inc. (U.S.), Chase Corporation (U.S.), Sigmund Lindner GmbH (Germany), and Mo-Sci Corporation (U.S.). Companies in this market compete with each other with respect to prices and product offerings to meet the market requirements. 11.6 Momentive Performance Materials Inc.
*Details on Business Overview, Product Offering Scorecard, Business Strategy Scorecard, Recent Developments Might Not Be Captured in Case of Unlisted Companies.